The Muscovy duck is an unmistakable sight with its bright red caruncles. This unusual looking duck has been kept for hundreds of years and is a staple, for many indigenous peoples of South America adding eggs and meat to their diet. Although originally a tropical bird it has adapted well to a variety of climates and can thrive in temperatures down to 10°F. It has become a common sight across much of the US and also as far wide as New Zealand, Australia, UK and Europe where small feral colonies exist. 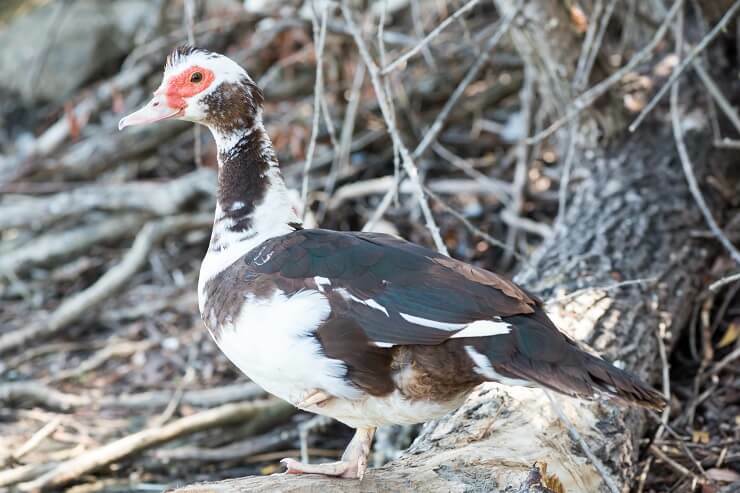 The wild Muscovy duck (Cairina moschata sylvestris) is actually a native of Mexico, Central America and Southern America. It is also called a Greater Wood Duck or Forest Duck. Prior to the arrival of Columbus a domesticated variety of Muscovy was bred and farmed by the indigenous people of the area. When the Spanish discovered the duck they named the wild Muscovy pato real and the domestic Muscovy pato criollo. The Muscovy duck was mentioned in the writings of Ulisse Aldrovandi but was not scientifically described and cataloged until 1758 by Carl Linnaeus. Although the Muscovy is called a duck, it isn’t really a duck. They are close to ducks but not really family members. The Muscovy is the only duck that is not bred from Mallard stock. 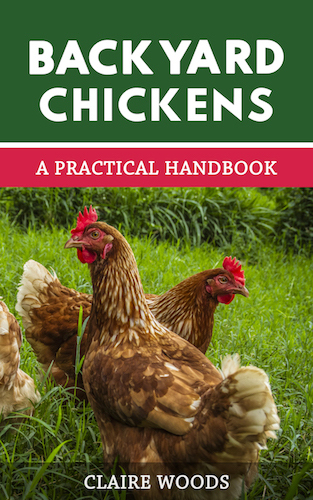 If you were to breed a Muscovy with a Pekin for instance, the offspring would be a sterile Mulard. In fact some people do and use the Mulard as meat birds. It is probably as near to the goose family as it is to ducks, it certainly grazes like a goose. The Muscovy is a large duck and can have a wingspan of up to 64 inches. It is also a heavy breed and can weigh up to 15lbs; although the girls are slightly lighter at 6-7lbs. As the males are so heavy they can struggle to fly, but the females are able flyers and you will need to clip their wings to prevent them escaping. It has a broad, long body (males around 30 inches) and a wide, flat tail. Colors are usually black and white but there can be many variations: blue, black, chocolate, pied (white with any color), green, white, lavender, bronze, barred and rippled. The black feathers of the male are iridescent in sunlight but the female coloration is more muted and drab in order to provide camouflage when nest sitting. The head is very unique. The facial ‘mask’ will be a dark red/blackish color – the caruncles will grow slowly and the boys will develop them before the girls. The caruncles are larger and more colorful on the male. The mature male will have a large dark red/blackish knob at the base of his bill. On the top of the head there is a crest of erectile feathers which the bird will raise if excited or nervous – the crest is larger in the males. The crest will be raised by the males in courtship to attract a mate. Eyes are a yellow/brown color. The eyes have a nictitating membrane that allows them to see underwater. The bill is flat and can be yellow, pink, black or any combination. It can also have pink ‘spots’ on it. The webbed feet are unusual in that they have long claws. These claws allow them to perch up in trees – hence the name “greater wood duck”. The feet and legs are black in color. What Makes the Ideal Muscovy Duck Habitat and Diet? Muscovies love a habitat of dense vegetation, large old trees and water of course! Wetlands, riparian areas or even the local golf course pond will attract them as long as there is some dense vegetation to hide in. Although they do swim, they don’t swim as much as other ducks because their oil producing glands are small and underdeveloped. They are omnivorous foragers, eating a variety of plant material, leaves, roots and shoots along with small fish, crustaceans, small reptiles and millipedes. They will eat mosquitoes and flies avidly and have been used as ‘pest control’ by some people. In fact, a Canadian study of fly control methods found that Muscovy’s ate about 30 times the amount of the various fly traps, papers and other methods tested! Feed wise, if you are raising them from ducklings, they should be given 28% gamebird starter which should be freely available. As they transition to adults they can be cut back to 20% layer pellets. They also enjoy mealworms and cracked corn as treats along with fresh greens and scratch among other things. You can learn more here. The Muscovy lays 60-120 large white eggs per year (a low number for ducks). Males reach sexual maturity in 29 weeks and the female matures in 28 weeks. 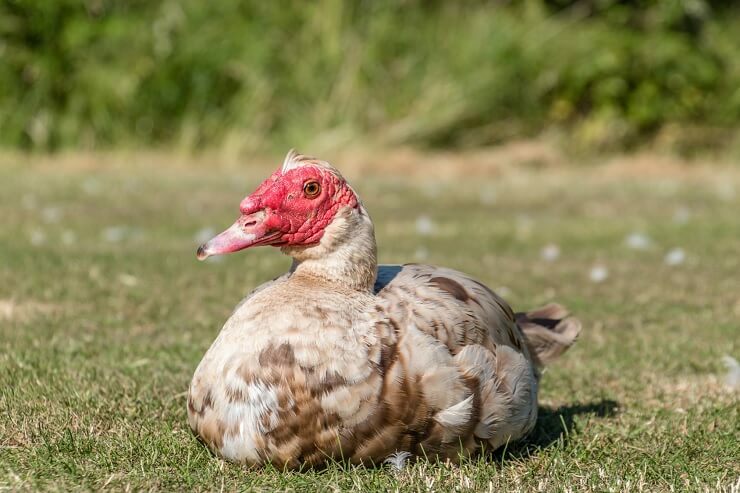 The mating season of the Muscovy can last from August to May. This can vary by climate and the females can have three to four broods per year as long as she has sufficient protein in her diet. There really isn’t any courtship ritual except for lots of tail wagging and erecting the head crest. Males have been known to fight each other for mating opportunities with the females. They are polygamous although a male may help with guarding the nest and ducklings. 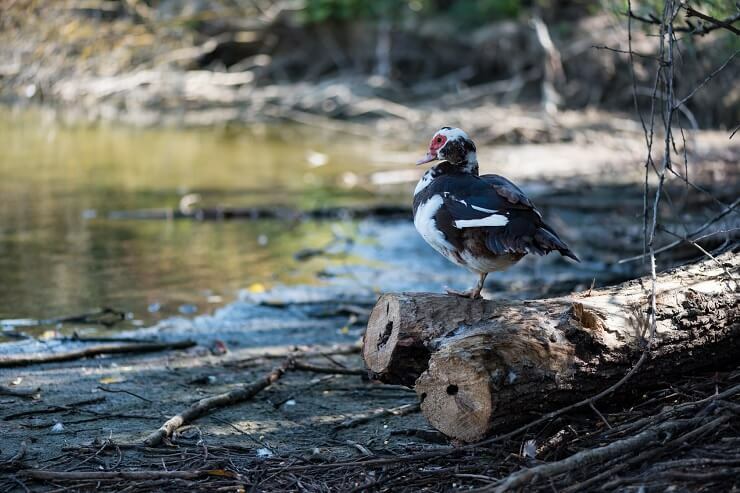 The female will set her nest in a large cavity in a tree or in a suitably secure ready-made nest box off the ground or an elevated duck house; they do not like ground sitting duck houses. Some folks keep them in with their chickens since Muscovies are not as mucky as a regular duck and the arrangement seems to work well enough. As she lays each egg she will ‘chirp’ so that the duckling will imprint on her voice, her clutch of eggs can be up to 16 or so eggs. She will then carefully incubate her eggs for 35 days until they hatch. Often a few females will brood together. The ducklings will stay close by Mama for 10-12 weeks to keep warm and safe. During this time they will be learning all the skills needed to survive. At 12 weeks the ducklings will be a good sized bird although not yet adults. 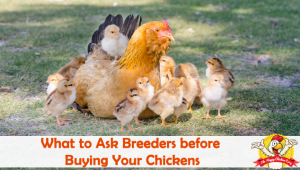 Why Do People Keep Muscovies? The Muscovy has been raised for eggs and meat for a few hundred years now. It has the highest meat yield of any duck. The meat is 98% fat free, is much less greasy than other ducks and there is approximately 50% more breast meat than a standard duck. It also has less calories and fat than a turkey pound for pound. The meat is said to have a strong flavor but this will vary on the diet of your duck as will the nutritional content. The taste of the meat has been likened to roast beef, veal or ham. The eggs are white and large and loved by pastry chefs the world over. Duck eggs contain more albumin than chicken eggs and that makes for fluffier pastries. The Muscovy is a very quiet duck; they do not quack like other ducks. They are usually fairly quiet unless attacked or excited. The females have a soft trilling vocalization while the males have a low hushed call. If upset, happy or excited they wag their tails a great deal and the males can also puff and hiss. They are fairly long lived with an average lifespan of 8-12 years, but in captivity Muscovies can live for up to 20 years. Health wise they are very hardy. Birds with large or excessive caruncles may be prone to frostbite in colder areas, so be aware and keep an eye open for any problems. 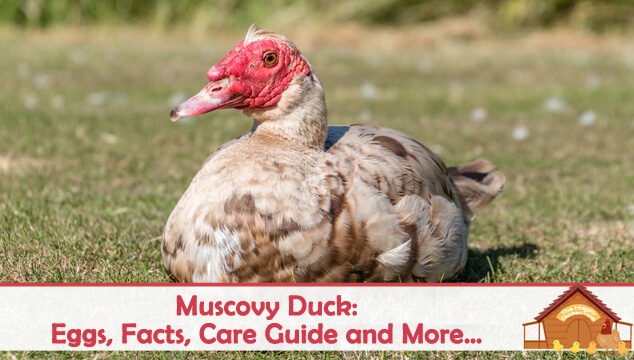 Is the Muscovy Duck Suitable For You? If you want a duck that lays lots of eggs, grows rapidly and is thrifty, the Muscovy is not for you. Instead the Muscovy is a quiet duck that is friendly and personable. It is also a slow grower and takes time to fill out to its’ full potential. Along with slow growth comes the cost of feed, although they can usually find a lot of their own food from the wild. The Muscovy is a friendly duck with a distinct personality. They don’t like to be picked up and petted, but they still enjoy some human company (they are also said to be good with children). They are non-aggressive with the exception of the mating and rearing season when they can become protective and territorial of mates and offspring. Whilst not really suitable for small backyards, a ¼ acre or more is preferable. Muscovies are quiet, peaceful ducks with personality. They ‘talk’ with their tail, wagging it furiously when animated or happy much like a dog does. They tolerate winter weather quite well as long as there is suitable shelter and rarely will they migrate unless the weather is severe. They are a personable bird that loves to hunt flies and mosquitoes among other things. I may just get some for that skill alone! We had a Muscovy duck years ago, some one dumped a cute little Easter duck that grew into a Muscovy. As a little guy he was super friendly, but when he got mature he turned mean. He would chase the kids, the sheep and the goose! this brings me so much joy! haha the idea of a muscovy chasing a goose is amazing. It must have been fast! and big! I had a ginormous white duck once that used to chase my dogs around but I think he got a bit overconfident and ended up becoming food for the local fox. A sad end to his life but my dogs were glad! A Muscovy laid eggs in my backyard . She has 4 eggs out of her nest . Why did that happen ? A Muscovy female know when her eggs are bad and will push them out. You can put them back in and mark them and they will be back out the next day. She will not set on dead eggs. How she knows is anybody’s guess, but she knows. I have been raiseing them for over 30 years and believe me , she knows. 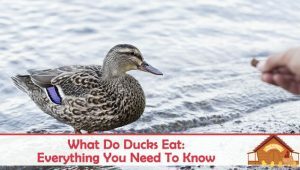 Interesting how you claim they are not ducks but then refer to them as ducks throughout the rest of the article… plus the greater wood duck is something completely different… Overall really good information though! I kept muscovies for years when I grew up and never knew they weren’t even ducks! They were never aggressive towards me as a child. Just scary looking but they never minded me playing with them, even during the mating season. This article brought back such fond memories of my beautiful babies and how they used to wag their tails and hiss. the one thing I really loved about them is how they moved, head left, tail right and vice-versa. plodding around the garden always walking in a line with the mum in front long after the babies had grown. We love our Muscovy ducks, we have a very handsome drake & 3 ladies. Darcy is broody, only sat on 3 eggs but is guarding them so well. It’s only been 14 days so we have a time to wait to see what happens, if anything.